This week two new newspapers make it onto the Kindle – they are both British newspapers. The Times, which I don’t know an awful lot about, and the Financial Times which I adore and consider to be one of the best newspapers in the world. The Times was first published in 1785 and is now owned by Rupert Murdoch’s News Corporation. The Financial Times has been in print since 1888 and its biggest competitor is The Wall Street Journal, while The Wall Street Journal has the higher subscription numbers, in my opinion the Financial Times has the superior content – I should know, Iv had it delivered to my home for the past four years. The Times and the Financial Times bring the total numbers of newspapers on the Kindle to 24. Its been about 9 months since Kindle was released and I am a bit disappointed to see that only 24 newspapers have jumped onto the Kindle – 15 US based and 9 International newspapers. The USA Today currently has the widest circulation of any newspaper in the United States with 2.25 million copies per weekday, however it has yet to make an appearance on the Kindle. We need more newspapers on the Kindle! As usual, a 14-day free trial is available for both newspapers. The Times is one of the world’s leading newspapers respected internationally for its news, comment and analysis. The aim of The Times is to provide its readers with strong news reporting combined with thoughtful and insightful opinions on the main issues of the day. Whether dealing with politics, business, foreign affairs, the arts, or sport, The Times offers the most comprehensive coverage. It has an outstanding global network of reporters as well as must-read columnists such as Matthew Parris, Gerard Baker, Caitlin Moran, Giles Coren and Anatole Kaletsky. 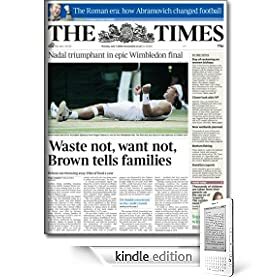 The Kindle Edition of The Times contains articles found in the print edition, but will not include some images and tables. Also, some features such as the crossword puzzle, box scores and classifieds are not currently available. For your convenience, issues are automatically delivered wirelessly to your Kindle so you can read them each morning. The Financial Times, one of the world’s leading business media organizations, is recognized globally for its authority, integrity and accuracy. The Financial Times provides a 360-degree perspective on global business and geopolitical news by harnessing a worldwide network of award-winning journalists who deliver extensive news, comment and analysis. The Financial Times is much more than a business newspaper, it is an intelligent and stimulating read covering everything from in depth art reviews to new discoveries in food and wine and interviews with the day’s luminaries. The Financial Times has an unrivaled collection of columnists, including Tyler Brûlé, Anthony Bolton, Clive Crook, Niall Ferguson, John Gapper, Robin Lane-Fox, Gideon Rachman, Jancis Robinson, Merryn Somerset-Webb, Philip Stevens, Lawrence H. Summers, Gillian Tett and Martin Wolf. 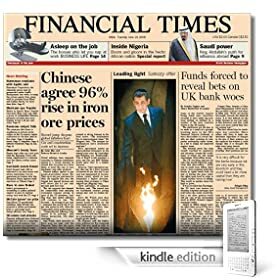 The US Kindle Edition of Financial Times contains most articles found in the US print edition, but will not include tables, charts and stock quotes. For your convenience, issues are automatically delivered wirelessly to your Kindle so you can read them each morning. The Financial Times US Edition is published Monday through Saturday. This entry was posted in Kindle Newspapers and tagged Financial Times, Kindle Newspapers, New Newspapers, Newspapers, The Times by Dzmitry. Bookmark the permalink. I have a Kindle DX and I receive the FT newspaper delivered to my home. I have received some adverts from the FT offerring a combined subscription FT newspaper and ft.online. These adverted say suitable for Tablets including Kindle Fire. While I’m not an FT subscriber myself, their site seems to be talking about gaining access to their apps. These apps include iOS and Android, but would not be suitable for the Kindle DX.